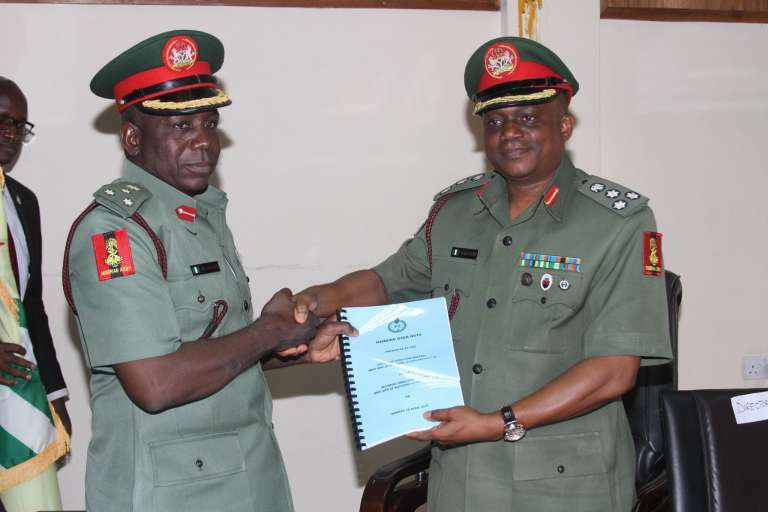 General Sule Zakari Kazaure takes over as the 17th Director-General of the National Youth Service Corps (NYSC). History was made on Monday, 18th April, 2016, as Brigadier – General Sule Zakari Kazaure assumes office as the 17th Director-General of the National Youth Service Corps at the Yakubu Gowon House, the National Directorate Headquarters of the scheme located in Maitama, Abuja. The new DG, who thanked the Almighty Allah for his grace, the President and Commander-in-Chief of the Armed Forces of the Federal Republic of Nigeria and the Chief of Army Staff for the priviledge to serve in NYSC promised to contribute his own quota to the development of the scheme. General Kazaure therefore solicited for the support of the entire staff of the scheme as he promised to give staff and corps welfare priority during his tenure of office. While thanking President Buhari for considering him worthy of the appointment, he noted that he is aware of the daunting challenges and the bumpy road to success but expressed optimism that with maximum cooperation, the task would be achieved. He pledged to make corps members’ and staff welfare his priority. ‘I want to thank you for the support and unalloyed loyalty you gave to the outgoing DG. I am soliciting for more support to consolidate on the success and achievements made towards moving the scheme to greater heights. I know that the task ahead is enormous and the road looks rough, but with unity of purpose, cooperation and support of all we will make progress. Therefore I urge all to be proactive, positive and be optimistic in all our dealings so that our efforts will give us the desired success of the scheme in line with the vision of the present administration’. ‘On my part, I understand the importance of a motivated workforce, therefore I will endeavor to give staff and corps members’ welfare a priority and in doing so, I will be fair and transparent in my administration in order to enable us succeed’, Kazaure said. Earlier in his farewell address before the symbolic handing over of the flag, the immediate past Director-General, Brigadier-General Johnson Olawumi recounted how he was ushered into the corporate Headquarters of NYSC on the 6th of January, 2014. He thanked the top Management and staff of the scheme for the enormous cooperation accorded him all through his tenure. ‘NYSC staff are industrious, competent and committed. Your unalloyed loyalty, support and general work ethics attest to this fact. I could not have achieved much without your loyalty and support, therefore, I thank you all immensely and pray that the Almighty God will sustain you and be with your families at every point of their needs’. ‘I crave your indulgence to support the new Director-General to enable him consolidate on the success and achievements so far recorded. Staff have a lot to contribute to the sustenance of the chronicles of this laudable scheme which has over the years contributed to the development of the nation.’ Olawumi added. Olawumi however lamented his administration’s inability to execute some programmes and activities like the sports and cultural festival due to paucity of fund but added that the management is at the verge of securing a sponsorship deal of 150 million naira with GLOBACOM Nigeria Ltd. He also hinted that his challenges while in office include the increasing corps population with lean financial resources but added that efforts were in gear to increase corps members allowances. The erstwhile NYSC boss urged the new NYSC helmsman to prioritize staff and corps members’ welfare during and after orientation camps in order to boost their morale for optimal productivity. In his vote of thanks, the Director Human Resource Management, Chief Anthony Ani, expressed appreciation to the President for appointing an Officer of General Kazaure’s calibre as the Director-General stressing that in the history of the forty-three year old Scheme, this would be the first time a Ph.D holder will be heading the Scheme. He assured the new Director-General of maximum cooperation of all staff. The event was witnessed by Management staff at the National Directorate Headquarters as well as all the NYSC State and FCT Coordinators. 0 Response to "General Kazaure Takes Over as NYSC DG, Promises Fairness to All"